From 1995 the Auckland Regional Council (ARC) explored the idea of developing an intensively managed conservation area - a 'mainland island' - within a regional park. The concept received support from within the ARC and from the community and this lead to the initiation of the Tawharanui Open Sanctuary (TOS) in 2000. 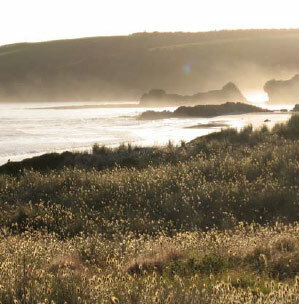 Tawharanui was selected because of its size, its location at the end of a peninsula, range of habitats and its proximity to significant conservation areas such as Hauturu (Little Barrier Island). Community support for the project was formalised through the inaugural meeting in 2002 of the Tawharanui Open Sanctuary chaired by ARC Councillor Bill Burrill. Soon after, TOSSI was formed with a constitution and a Memorandum Agreement signed with the ARC. The major task facing the new TOSSI committee was to raise funds to help build the pest-proof fence. One means of achieving this was through the staging of the first Art in the Woolshed Exhibition in 2003. Further funds were raised by a “Get in Behind” campaign to encourage donations from the public. In 2004, "The Big Plant" (a major revegetation program) was commenced by the Council and TOSSI; the second Art in the Woolshed Exhibition was held; the pest-proof fence was completed; and the ARC used helicopters to drop bait across the peninsula to target introduced predators. The following year bellbirds recolonised Tawharanui from Hauturu. These first years set the pattern for TOSSI's future: extensive revegetation programs, the reintroduction of fauna, regular Art in the Woolshed Exhibitions, fundraising for programs on the Park and pest control.